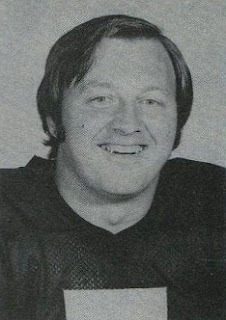 The versatile Conrad played at quarterback, halfback, and fullback in addition to end in college and was part of the 1956 Texas A & M team that won the Southwest Conference title. He also starred in the 1958 College All-Star Game upset of the Detroit Lions, kicking four field goals and intercepting a pass. Conrad was chosen by the New York Giants in the fifth round of the ’58 NFL draft but was traded to the Cards prior to the season and was used in the defensive backfield as a rookie, intercepting four passes, as well as for returning punts and placekicking. 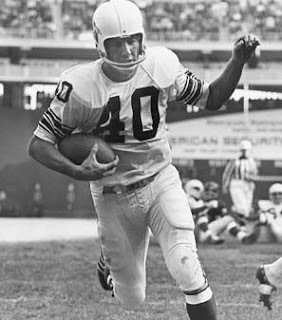 He was shifted to offense in 1959 and backed up at halfback for two seasons, rushing for a career-high 328 yards in ’59, before being moved to flanker in 1961, where he broke out with 30 catches for 499 yards (16.6 avg.) and two touchdowns. Conrad had a bigger year in 1962, hauling in 62 pass receptions for 954 yards (15.4) avg. and four TDs as part of a productive tandem with split end Sonny Randle. Cardinals went 9-5 to finish third in the NFL Eastern Conference. Conrad followed up with 61 catches for 780 yards (12.8 avg.) and six touchdowns in 1964 and achieved Pro Bowl recognition. Consistent if not especially fast or flashy, he remained a capable possession receiver for the Cards through 1968, a total of 11 seasons, before finishing up with the Dallas Cowboys in 1969. Overall, he caught 422 passes for 5902 yards (14.0 avg.) and 38 TDs, with 418 of those catches for 5828 yards and all of the TDs coming with the Cardinals. Conrad also returned 33 kickoffs for a 24.6-yard average and 51 punts for an average of 9.1 yards and two TDs. As a placekicker he booted 14 field goals out of 33 attempts and made good on 95 of 99 extra points which, combined with his 42 touchdowns, accounted for a total of 389 points. 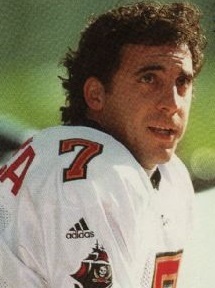 Conrad received first-team All-NFL recognition once, second-team honors after one other season, and was selected to one Pro Bowl. Two 8-4 teams that were in the running for playoff spots in the United States Football League’s third season met in Denver on May 19, 1985. The hosts, the Denver Gold, were in contention with Oakland and Houston in the Western Conference while the visiting New Jersey Generals were trying to keep pace with the Birmingham Stallions, Tampa Bay Bandits, and Memphis Showboats in the Eastern Conference. The Gold were coached by Darrell “Mouse” Davis and utilized his run-and-shoot offense. 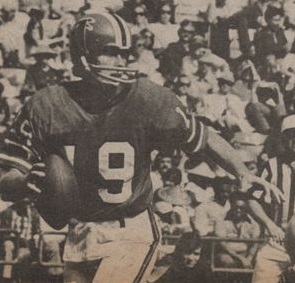 After starting slowly, Bob Gagliano replaced nine-year veteran Vince Evans at quarterback and the club had won four of five games. WR Leonard Harris was the favored target on pass plays and RB Bill Johnson (pictured above) was productive carrying the ball. As had been the case since the Generals came into being, RB Herschel Walker was the key to the offense, and he had a string of six straight hundred-yard rushing games on the line coming into Denver. Prize rookie QB Doug Flutie was suffering growing pains but brought mobility and a strong arm to the offense. There were 29,139 fans in attendance at Mile High Stadium. The Generals struck quickly on their first play from scrimmage as Herschel Walker looped out of the backfield and sped past the coverage to pull in a pass by Doug Flutie for a 68-yard touchdown. Roger Ruzek added the extra point for the early 7-0 lead. Following an exchange of punts, the Gold put together a quick three-play, 63-yard drive that featured a carry by Bill Johnson and a personal foul on the Generals that set up a 30-yard scoring pass from Bob Gagliano to Leonard Harris. Jim Asmus tied the game with the point after. Neither team threatened again until late in the opening period when the Gold, deep in their own territory, turned the ball over when Johnson fumbled while fighting for extra yardage on a running play and New Jersey recovered at the 12. A sack of Flutie moved the Generals back but they regained the lead by three points on a Ruzek field goal from 35 yards. The score remained unchanged during the second quarter as the defenses dominated and a rain shower passed through. With 1:23 remaining in the first half, DE Calvin Turner of the Gold recovered a fumble by FB Maurice Carthon at the New Jersey 15 and, shortly thereafter, Johnson took a pitchout and ran three unmolested yards for a TD. Asmus converted and Denver took a 14-10 lead into halftime. The Generals started the third quarter by advancing methodically on a 12-play, 80-yard drive that featured ten carries for 31 yards by Walker and a fine pass from Flutie to WR Walter Broughton. Walker crashed over for a touchdown from five yards out, Ruzek added the extra point, and the visitors were back in front by 17-14. The Gold responded by going to the air and Gagliano connected with WR Vincent White for a 48-yard gain to the New Jersey 15. A pass to Johnson out of the backfield picked up 12 yards and Johnson powered over for a three-yard TD. Asmus kicked the point after and Denver was in the lead by 21-17. The Generals were driving as the game headed into the fourth quarter and Walker started the final period off by hurdling for a yard to convert a fourth down at the Denver 16. 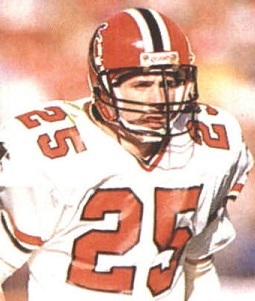 Flutie bootlegged to the six and, with Walker pounding into the line play after play, the visitors again faced a fourth-and-goal situation at the one that resulted in a Walker touchdown dive. Ruzek’s kick had New Jersey ahead in the back-and-forth contest by 24-21. Denver again responded with a 69-yard scoring drive in which Gagliano completed passes to four different receivers and concluded with Johnson blasting into the end zone for the final yard and a TD. Asmus converted to put the Gold up by four points with 6:02 remaining to play. 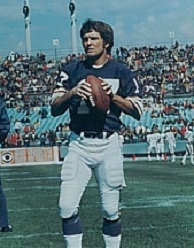 The offenses had taken command in the second half with every possession ending in a touchdown and it appeared that the Generals might continue the trend on the next series but, after reaching the Denver 43, Flutie was sacked for a five-yard loss on second down by LB Craig Walls and, while a throw to Walker gained seven yards, a fourth-and-four pass was tipped and fell incomplete. A clutch completion to Johnson that converted a third down allowed Denver to run the clock down to 22 seconds remaining before the Generals were able to regain possession and the Gold won by a final score of 28-24. Denver had the edge in total yards (310 to 301) and first downs (17 to 15) although the Generals led in time of possession (32:42 to 27:18). 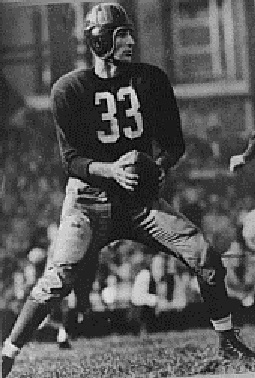 New Jersey also accounted for four sacks, to two by the Gold, but the Generals turned the ball over twice, one of which led to a Denver touchdown, to one by the home team. Bob Gagliano completed 17 of 31 passes for 242 yards (167 of which came in the second half) and a touchdown while giving up no interceptions. Bill Johnson rushed for 98 yards on 23 carries that included three TDs and caught four passes for another 46 yards. Leonard Harris also had a team-leading four pass receptions, for 62 yards and a score. For the Generals, Herschel Walker was productive despite Denver’s efforts to stack the line of scrimmage, gaining 142 yards on 36 rushing attempts with two touchdowns and pulling in three passes for 106 yards that included the one long TD. Doug Flutie was successful on just 5 of 15 throws for 141 yards and a touchdown while being intercepted once. Denver went on to place second in the Western Conference with an 11-7 record and qualified for the postseason where the club took a thrashing in the Quarterfinal playoff round at the hands of the Memphis Showboats. As for the Generals, the loss dropped them to 8-5 and they also finished at 11-7 and second in the Eastern Conference. They lost a close Quarterfinal round game to the Baltimore Stars. Bill Johnson rushed for a total of 1261 yards on 212 carries (5.9 avg.) with 15 touchdowns. 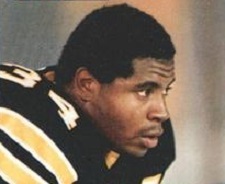 His yardage ranked third in the league and he received All-USFL recognition from College & Pro Football Newsweekly. At the top of the rushing rankings was Herschel Walker, who gained a gargantuan 2411 yards on 438 attempts (5.5 avg.) and also led the circuit in scoring with 22 touchdowns for 132 points. 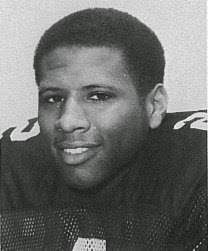 He received consensus Player of the Year as well as All-USFL honors. A high school quarterback, Burrough shifted to wide receiver in college and received some All-American consideration as a senior in 1969. 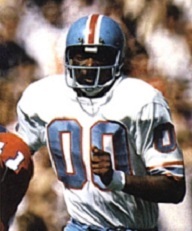 He was chosen by the New Orleans Saints in the first round of the 1970 NFL draft (tenth overall) but after a quiet rookie season was traded to the Oilers in ’71. Talented and with great speed, Burrough also was inconsistent on a poor club. In his first four years with Houston, he caught 130 passes for 1960 yards (15.1 avg.) and nine touchdowns. Oilers went 10-4 to finish third in the AFC Central. The lanky, long-striding Burrough followed up with 51 catches for 932 yards (18.3 avg.) and seven touchdowns in 1976. He returned to the Pro Bowl in ’77, pulling in 43 passes for an AFC-leading 816 yards (19.0 avg.) and 8 TDs and remained a productive receiver until knee and wrist injuries in 1980 that limited him to two games and four catches. He came back to catch 40 passes for 668 yards (16.7 avg.) and seven TDs in 1981, but missed all of ’82 due to injury and never returned. Overall, Burrough caught 421 passes for 7102 yards (16.9 avg.) and 49 touchdowns. Of that, 408 pass receptions for 6906 yards and 47 TDs came with the Oilers. 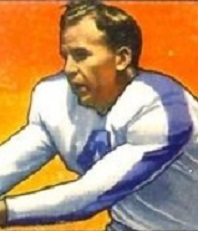 He received second-team All-NFL honors once and was chosen to two Pro Bowls.